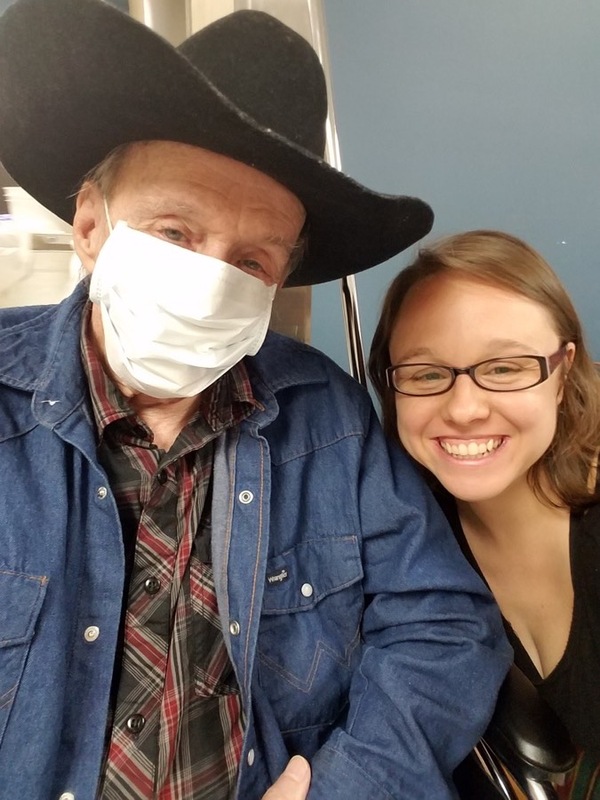 Jennie White’s decades of prayer for her cancer-stricken dad led to salvation — and reconciliation with his estranged mom. My dad lost a lot. His mom left him after a nasty divorce when he was only 2. His stepmother abused him his whole childhood. All of those experiences left him with a bitter taste for Christianity and for the people that claimed to follow Jesus. At 34 years old, he had walked away from Christianity and sought God through other avenues. He studied Native American literature, Hinduism, Buddhism, and finally, the Wiccan religion. When I left home, he was a practicing witch. He believed in a god, just not the one named Jesus that those cold-hearted, hateful, judgmental people claimed to follow. Me and my father, Mack. My parents moved to South Carolina to live with my family when my dad’s health began to deteriorate. I became a believer at 16 and started praying for my dad's salvation. As the years passed, I would always try to show my Jesus to my dad, but he refused to believe. He would suggest that my belief in Christ was no more significant than the Wiccan belief in Mother Earth — that by being a good person and sending out "light," we can be part of the "good" in the universe. Any time I would get a chance to share the Gospel, I did. But something would always happen to interrupt us — it never failed. The phone would die, someone would call in, someone would knock on the door. It was disheartening. In 2015, my small group at NewSpring did a Bible study, and we talked about whatever-it-takes prayers. Through my small group, the Lord gave me the knowledge and the courage to pray that prayer. 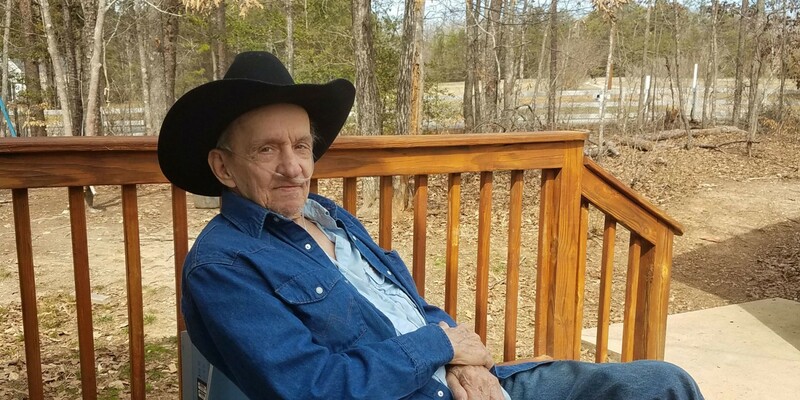 I fasted, wept, and prayed for weeks that God would do whatever it takes to save my dad. I finally heard a little voice whisper "lung cancer" as in the form of a question. I prayed and said "Lord, if that is what it takes, give me the grace to handle it. But whatever it takes, please save him." He couldn't help but notice something was different about me and my friends from "that church." On Oct. 31, 2016, my mom sent a text saying my dad was coughing up blood. He and my mom lived four hours away in La Grange, Georgia. 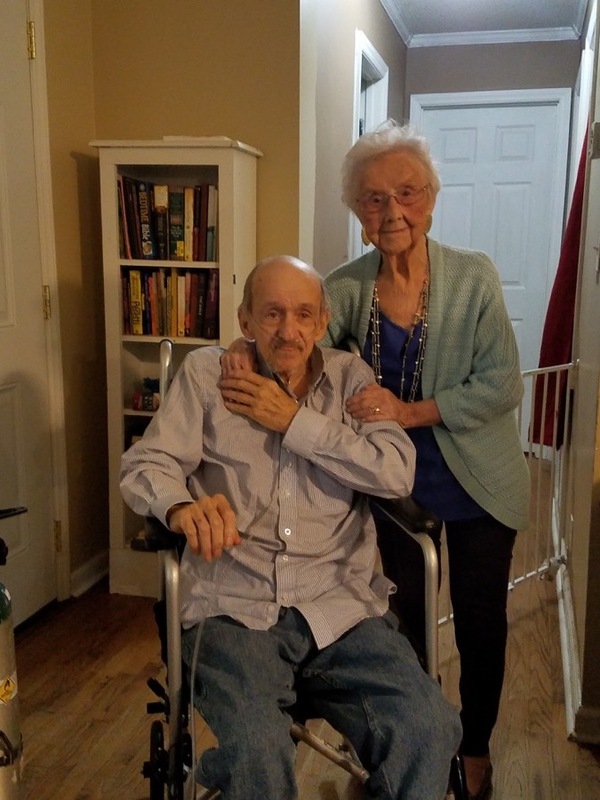 My husband and I decided it would be best to bring my parents home with me because their health and mobility had been slowly deteriorating, and they needed help in the day-to-day. The whole time my dad was in our home, friends from my home groups would come meet him and pray with him. They were sending food and just being the hands and feet of Jesus for my family and doing whatever we needed to help with my parents. Dad got to see first-hand what true followers of Christ are like. My friends would drop by to hang out with him and look at his guitars or just talk to him. While they were there, they would lend a hand and help me fold clothes, mop the floor, make dinner — whatever they could do to help. One sweet friend even brought Christmas gifts — one for each night in December for each one in our family!!! My dad was so blown away by the outpouring of genuine love that he couldn't help but notice something was different about me and my friends from "that church." My small group of ladies showed my parents so much love, and it made the difference in overcoming longstanding resentments against church people. At the risk of sounding boastful — I'm not! — my dad saw me give up so much of my life and time just to care for him that he would tell me very frequently how much he appreciated what I was doing and that he couldn't repay me. I would always answer, 'it's not me, it's Jesus'. During that time, on Dec. 16, 2016, we learned that my dad had lung cancer. He was told that he had a year to live and that the treatment would kill him faster than the cancer. He opted to fight it with natural medicines and, if they didn't work, then he was still better off dying from the cancer than the treatment. 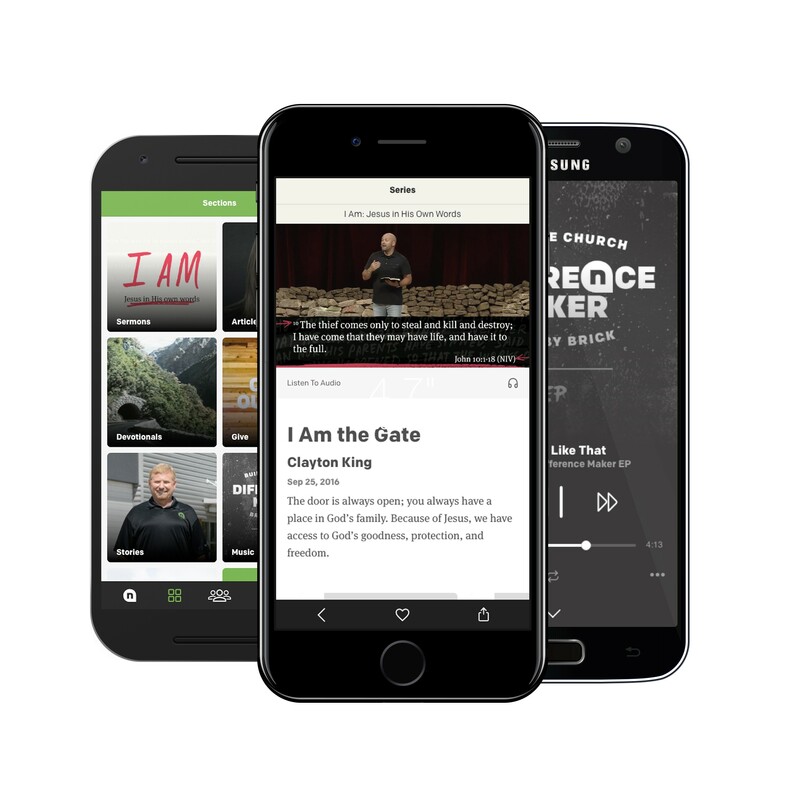 The NewSpring Christmas service that year included a short film focused on an old man, nearing death, named Simeon, who was part of the story of Jesus birth. The video trailer included the Bible verse, "He shall not taste of death until he met the Lord Jesus." In that moment, I learned the difference between faith and belief. I went from having faith that God COULD save my dad, to believing that He WOULD save my dad!! I had a heart to heart with God, and I got pretty upset with Him. On a Friday night in January, our dear home group friends arranged to meet my dad at a little Mexican restaurant (his favorite) in Belton for the specific reason of praying with and for him. After we ate, we went outside and my precious friend, Ms. Susan, asked my dad if he wanted to pray to receive Christ. He said, "No." And honestly, I was heartbroken. We got home and I took a shower. I had a heart to heart with God, and I got pretty upset with Him. I shook my fist at Him and reminded Him that He said if I ask anything according to His will that He will answer me. I reminded Him that I was doing my part to show my dad what a true believer looked like. I was sacrificing everything for the cause of Jesus, and He dang well better listen! I got angry because it seemed like He had totally abandoned me and my dad. I'd been praying for my dad to be saved for 20 years. My father pictured with his mom. She left him at age 2 after a divorce. I dried off, went to the kitchen, and started washing dishes. Dad came in and just stood beside me for a while. Then he said words that are etched onto my heart forever: "I see something in your friends from that church and you that I have never seen before. Y'all have a connection to the universe. There is a light, peace, and love in y'all. How did you get that?" 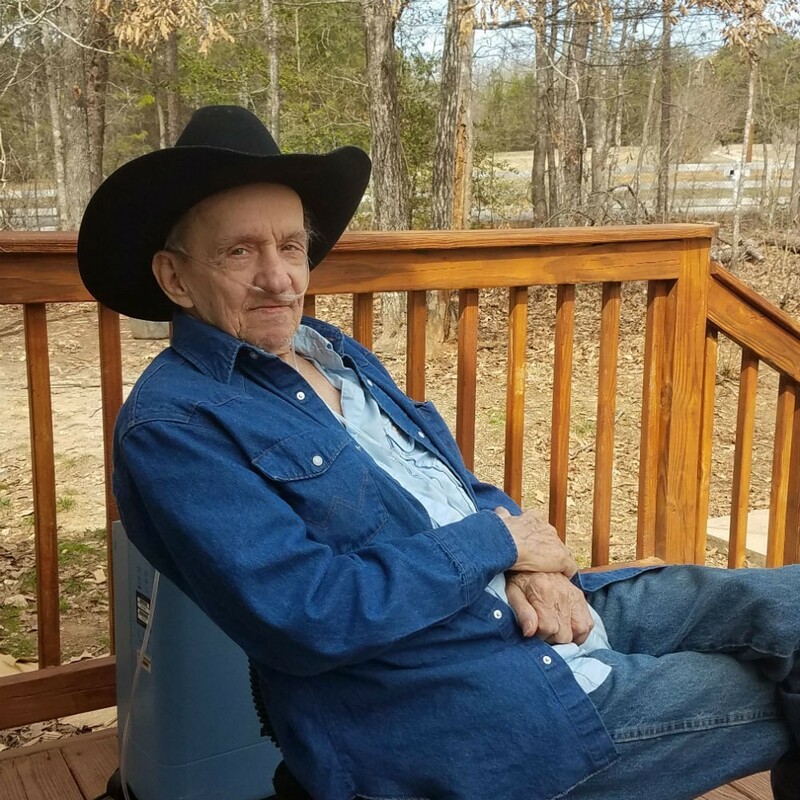 I looked at my sweet, 74-year-old daddy and was able to say, "Yes, we have a personal relationship with the creator of the universe. In Him is light and in that light, there is no darkness. His name is Jesus." His next question brought me to my knees, "How do I get to know Him? Your Jesus isn't the Jesus that I've ever known. I want to know Him." My cousin was praying for a way to contact my dad when I felt the Lord speaking to me to find her! I sat down and read the Romans Road with my dad and was holding his hand as he prayed to receive Christ at 10:33pm that night! There is no greater joy!!! I have gotten to lead all three of my children to Christ, but that was something different — something supernatural. On May 16, 2017, my dad saw angels in his room and saw beautiful things in his room that made him smile and want to leave this world. On May 18, he closed his eyes on earth and opened them in heaven. 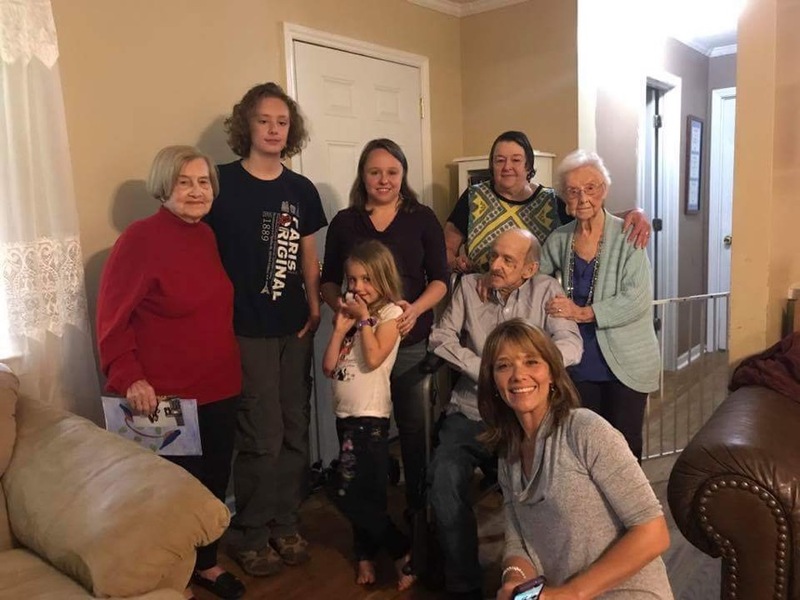 Family members, along with my grandmother, visited from Alabama two weeks before my father died. My father and grandmother’s reconciliation was made possible when I made contact with my cousin, Susan, (front, kneeling) on Facebook. Three weeks before he died, the Lord put it on my heart to try to reach my dad’s mother. They had been estranged for 37 years by her own choice. I had no contact info, but the Lord put the name Susan on my heart. I did a Facebook search, and the first one to pop up was Susan Heyser Johnson. I'd vaguely remembered my dad mentioning that name. I contacted her, and my message went something to the effect of "This is awkward. I think we're cousins. My dad is dying. If you can contact his mom and let her know, I'd appreciate it. Just thought she should know." When Susan, my cousin, got the message, she and I were on the phone five minutes later. She was praying for a way to contact my dad when I felt the Lord speaking to me to find her! My grandmother had prayed to receive Christ that January as well and had been looking to get in touch with my dad since then. She had no idea he was sick. She just wanted to be reunited with him. The next day, my dad heard his mother's voice for the first time in 37 years. As soon as he said, "Hello", she started saying, "I love you. I miss you. I'm so sorry!" Two days later, my 93-year-old grandmother rode all the way from Birmingham, Alabama, to be able to hug my dad. Before she left, she told him that she was so glad that they both had prayed to receive Christ so they could be together in heaven and she could spend eternity making up for the wrong she had done to him on earth! It was the sweetest time of healing for both of them! He died 15 days after being reunited with his mom. The Lord moved my family to Alabama in August 2017, and I have a very close relationship with my grandmother now. I see her several times a month and we talk almost every day. There is no mountain too big for my Jesus!